Presented by Seriously Free Speech and Independent Jewish Voices. 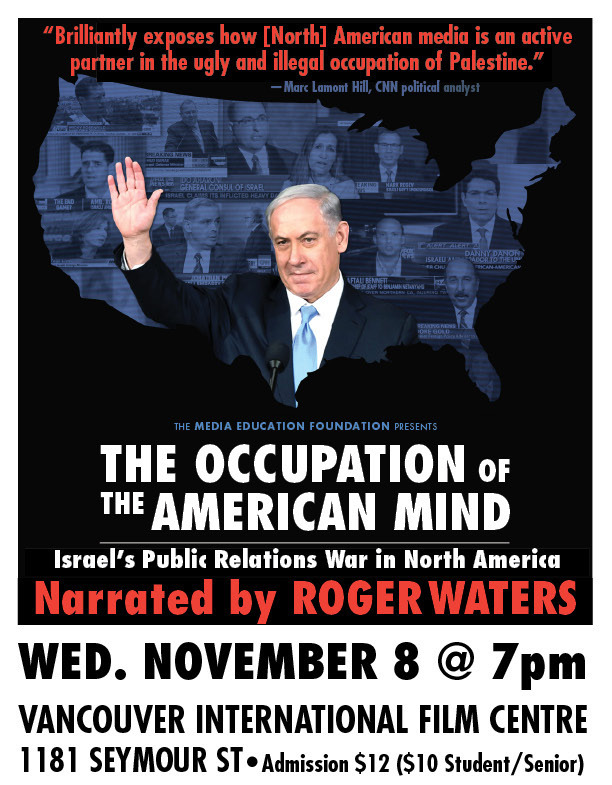 Narrated by Roger Waters, this compelling and important film examines how the Israeli government, the U.S. government, and pro-Israel lobbying groups have waged a series of coordinated PR campaigns to manage political fallout from Israel’s illegal occupation of Palestinian land and shape North American media coverage of the Israeli-Palestinian conflict in Israel’s favor. 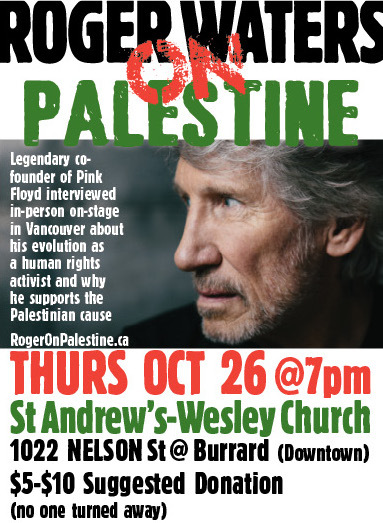 To invite your friends to the facebook event goto rogeronpalestine.ca and share the event. Vancouver’s activist community lost a valued friend in December, when Brian Campbell died of lung cancer. Brian was a man of rare depth, a fierce advocate for human rights, a committed socialist, a tireless organizer, and a tender and understanding friend. He was a dependable presence on picket lines and marches, his strong baritone chanting and singing above the crowd. It is with great sadness that we report that Brian Campbell, one of the founders of the Seriously Free Speech Committee (SFSC), died from cancer on Dec. 27, 2016 at the age of 72. Brian helped organize the SFSC in 2008 to defend three people being sued by CanWest for parodying the Vancouver Sun’s biased pro-Israel coverage. 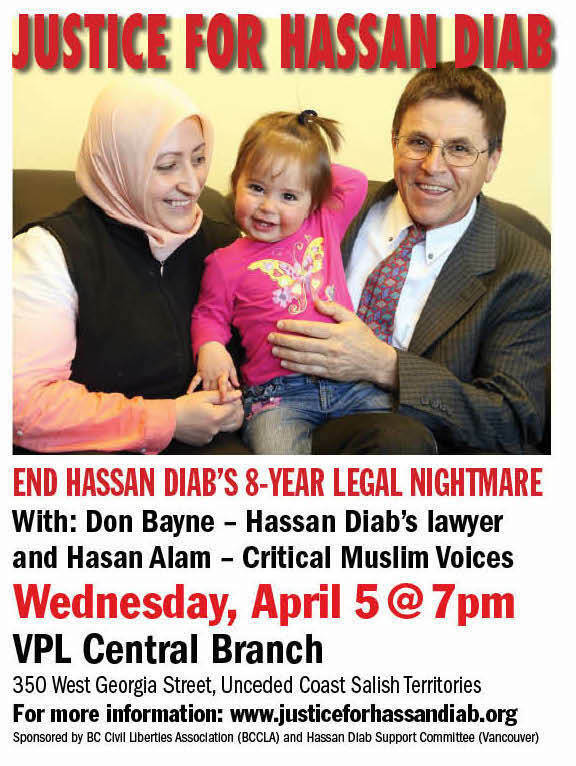 Nine years later, the group continues to defend individuals and organizations that are attacked for supporting Palestine, falsely accused of anti-semitism, and threatened with lawsuits and the loss of tenure, research grants, or even their jobs for criticizing Israel. Throughout his 25-year career at the Vancouver Public Library, Brian defended free speech, promoted free and equal access to information, and was part of the original campaign to push the BC government to adopt a freedom of information law. In 2015, the Canadian Library Association named him recipient of their Advancement of Intellectual Freedom in Canada Award. Brian spearheaded numerous SFSC campaigns, fighting the passage of Bill C-51, Canada’s draconian anti-terrorism law passed by the Harper government and urging its repeal by the Trudeau Liberals; organising against the threat free speech from federal and provincial resolutions condemning BDS (Boycott Divestment Sanctions campaign calling on Israel to abide by international law) supporters; calling for the reinstatement of fired University of Illinois professor Steven Salaita for tweets expressing his anger over Israel’s brutal bombing of Gaza; and fighting efforts to criminalize opposition to Israel’s policies and actions, including the so-called Canadian Parliamentary Coalition to Combat Anti-Semitism, New York’s threat to cut off funding to public bodies that divest from Israel or France’s anti-BDS law that has put supporters in jail. A long-time socialist, Brian was a major force in the Boycott Israeli Apartheid Campaign and other movements, including Eco-Socialists and Stop Kinder-Morgan. Brian generously contributed time, money and hard work to the many progressive causes he supported.